Up to allotment again armed with fork and container. This time dug up all the remaining onions and wished again for a bigger crate. Another two containers of French beans, some beetroot and lettuce etc. And two sweetcorn from Chris. Donated a pile of it to apf. Discovered beetroot take an age to boil. 1-3 hours depending on size! Or 30 mins in a pressure cooker. Must dig it out next time! Went out bean hunting in the back garden and donated a pound of runners to next door downhill. Went up to allotment again. 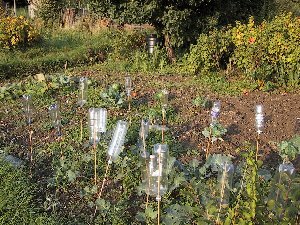 Broccoli just about struggling to keep ahead of the pigeons and the cabbage white caterpillars but they are growing quite well. Two more marrows are blowing up. Picked all the French beans that were waiting - 1½lbs of them! Pulled another couple of leeks (one went to Chris in return for her sweetcorn last week) and ran out of room again in the crate before I even got to the potatoes. Investigated the carrots and found that the thinnings are in fact quite respectably sized carrots. Pulled a couple of bunches and donated a few in Chris's direction. Hunted through the undergrowth and rescued most of the stepover apples, which are really nice. Found a 1lb cooker had fallen, and despite the hole where it landed on a piece of wood, it's definitely useable. The eater is starting to drop apples now, and I haven't a clue how I'm going to pick the bramley… Stepladder I reckon! The lettuces are bolting, darn them! Had a wonderful tea - marrow, beans, carrots, potatoes (all home grown) and some chicken. I really need another freezer. I think I ordered a second freezer. Too stunned by the news. Freezer arrived at 10am. Went up to the allotment straight from work and discovered that the marrow on the bigger plant is massive! Picked it, together with another pile of French beans, another bunch of carrots and rescued a few more apples before the slugs get there. I'm trying hard to grow organic carrots but the slugs are everywhere and huge and I'm on the brink of slugbaiting the rows. Picked the cauliflower, as I think something's been nibbling at it, and the florets are separating so at 4½" it's probably as big as it will get. Got home, switched on the freezer and got preparing vegetables to shove in it. After it had cooled down to a working temperature, added this year's cultivated blackberries and last year's blueberries, leaving the wild blackberries in the kitchen. I got a bit of a shock as I realised I have an *entire* drawerful of runner beans. Prepared more carrot batons for Christmas, and wondered if I should freeze a (prepared) marrow as I'm only 2/3 of the way through the last one! Added yet more runner beans to my hoard. Went to garden centre in search of a real trug, and of course now I want a real one, I find the plastic replicas I was looking for the other week! And a free pair of gardening gloves, so that was quite good. Also got a new bag of compost and discovered they had 2 for 1 on chicken manure pellets, so they worked out at £3 each instead of £4.50-£5. Lugged it all up to the house with help from P. grabbed a bit of lunch then dashed back out again to the allot armed with my nice new trug and the crate. Dug up most of the potatoes (there's some huge ones) and a fair few weeds, three of the leeks, yet more carrots, a few French beans, the rest of the beetroot and hooked a few more bramleys down off the tree. Bought yet more chicken pellets on the way home, this time for Dad. Cooked and pickled the beetroot and froze the French beans. Apples tomorrow! Very cold - put heating on and dug out the conservatory heater. Now to try and calibrate it again with the help of the digital thermometer. Vile wet and windy weather arrived about teatime. Mum commented that she ate my carrots and she'd forgotten how they should taste after years of buying cheapie supermarket ones. I suggested she get organic ones, as they're better, but she won't cos of cost. I think I'll have to sow her a little carrot patch next spring. Considering these were only planted June 28th they didn't do badly. Not quite been in 3 months. Reminds me of the comment Paul made on the onions - so used to slightly soft supermarket ones that my solid cricketballs were a bit of a shock. Rang Walkers bulbs. Mine are scheduled to go out in the next batch, ie end of next week. Three days' delivery, so they should appear on my birthday. Hurrah. Now all I've got to do is work out which are whose. Got home and found that the wretched tree rats have already dug up one of my crocus pots. And had bumped into the mesh. Grin. Disappeared into the allotment as fast as I could to try and get some more digging done before it went dark. Now over halfway across the top patch, though stopped digging and went to weeding between the broccoli as they were getting a bit overwhelmed by speedwell as shown in the photo! Found a picklesized leftover onion that I'd missed first time round. Dug up some bindweed, as I was told it's useless trying to use glyphosate a this time of year. Carrots now quite large but are being nibbled carrotfly faster than I can pick and prepare them. Still, some decent sized ones now coming up and I have a huge bagful of batons in the freezer. Got another bag of French beans, though they are mostly weird shaped ones now. Next year I am going to plant them straight into the ground and earlier too! But then, I won't have to dig the plot in May. Leeks doing nicely, though growth has definitely slowed off. I'll probably pick a couple more for the freezer for Christmas use, and then just get some when I need them. Nice day. 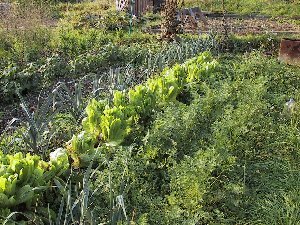 Replotted the allotment plan for next year. It was getting a bit silly, with this bit manured, that bit not… trying to do a threeway rotation with two plots… I figure the best solution is to dig up the path of grass, which is not going to be easy. Then it will divide up neatly into three sections of 3m each, and I can work out contents that don't follow on too badly from this year. Course this may be easier said than done! And I have space for raspberry canes… It would be more of a block plan than rows plan, which makes netting the brassicas much easier as well. Went up to allotment and got going on more digging. This time I'd got the small hand fork for getting shot of the speedwell and other weeds before then digging over an area without having to keep stooping. Much faster. Picked a few carrots, a couple of beetroot I'd forgotten :-) and a couple of bramleys. Vincent was putting in spring cabbages and asked if I had some - I did but something ate them. I will now have a few waiting for me when I get up there sometime in the next week. Then Jim appeared for the first time in ages (been on holiday) and I took my chance to ask where you could get raspberry canes. He went home and fetched the Marshall´s mail order booklet. I wish I could do something in return - these folk are so generous! Did give Vincent one of the tripover apples though! Jim then gave me a marrow - more for my store of them. I hope at least one will make it to Christmas. Went hunting for one of the nurseries Jim had told me about, and got a bit lost in some more amazingly pretty villages. On the way back, retracing my route, I saw the tiny sign for the place. Turned out to be a mixture of garden centre, nursery and all-round hardware shop. And they had a large trug. Bit expensive, but I guess keeping these places open has to cost something and I´d rather do that. They also had a few nuts and bolts, so when I got home I could fix the wheelbarrow's loose nut. The trug vanished into P's study to be given back to me on my birthday. Browsing the Sutton's seed website later, I found that the deadline for ordering the autumn onions was today. Urk. £1.95 and unknown postage later… I now await the delivery of 8oz of Radar onion sets.